The Just a Card campaign, set up by artist Sarah Hamilton, is engaging makers, designers, retailers, and consumers to spread the word that supporting independent makers and galleries can be as simple as buying "just a card". The little things add up and many independent outlets depend on these small sales to support the overall whole ....the message is simple. And effective. The campaign is proven to be making a positive difference, after three years of incredible work and dedication from Sarah and her team of volunteers, both shops and makers are saying it is impacting positively on their income and momentum around the campaign is growing every day. It includes a new Xmas Gift guide and Christmas cards designed by Benedict Cumberbatch, raising vital funds for Anno's Africa. Friday 24th November saw Just a Card launch INDIE FRIDAY - a movement against Black Friday "Say no to crap TV and blatant consumerism...Let's celebrate the craft, passion & love of INDEPENDENTS on INDIE FRIDAY. Many Independents can't compete with discounts offered by chains. We are the little people.....until now - let's be loud, proud and united". 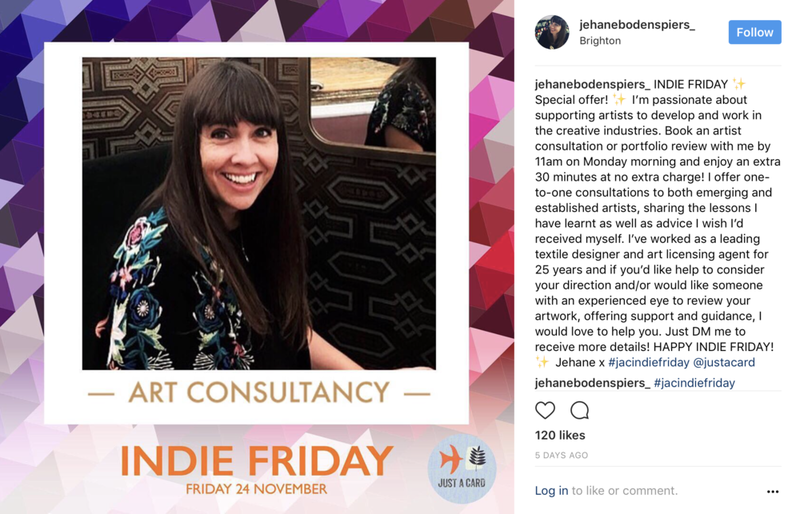 My own offer for Indie Friday has generated art consultancy sessions with artists from the UK, New Zealand, and the USA. The JUST A CARD message doesn't just sound good - it works! Join in with Just A Card hour tonight - every Thursday at 8pm. Let's all help our creative industry to thrive.